The Study: The influence of pelvic adjustment on the posture of female university students. The influence of pelvic adjustment on the posture of female university students. a. The authors looked at changes in posture in female university students who received pelvic adjustments using the Gonstead Technique. c. The subjects were female university students and they were divided into a group that received the adjustments and a control group that did stretching only. d. A thrust was made for a posterior inferior innominate with the patient prone. f. A Back Mapper was used to make the postural measurements. g. The stretching group showed no significant changes, but the adjustment group showed significant changes in trunk imbalance, pelvic position, pelvic torsion, and position of the scapulae. Global rotation is the sum of all the relative rotations so if you changed one or more relative rotations you would tend to affect the global rotation to some degree. In other words, if you change the alignment of boney structures then you will tend to affect the posture. But why do I say “tend to”? Because, I want you to understand that this subject is more complex than simply improving the alignment of a single segment and then automatically assuming that global alignment will also improve. 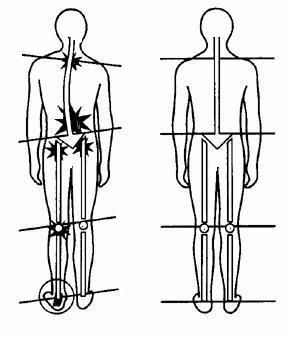 Likewise, it is possible for patients to demonstrate reasonably healthy global posture and still exhibit small, single segment problems (misalignment, dysfunctional motion, etc). You need both good relative and good global alignment. But then you regularly read Science in Brief so you already had that figured out. This entry was posted in Knowledge Base and tagged Back Surgery, Constipation, Dr. keefe, Fatigue, Natural Healthcare, tulsa chiropractor by DocJohn. Bookmark the permalink.